Lammas Day – Zero Equals Two! It is written in Liber AL vel Legis II:36, “There are rituals of the elements and feasts of the times.” Today, August 1, is the celebration of Lammas, believed to have been an Irish-Celtic festival, possibly also observed in Anglo-Saxon cultures. This corresponds with the approximate time of the first grain harvest in the northern hemisphere. It’s traditional to celebrate this feast with bread, and often with a bonfire or campfire. The recipe below can be cooked over a fire. Divide into six portions and flatten with the palm of your hand to form discs. Select a long thin stick and clean off the end with a knife. Form the dough around the stick. Scrape some of the coals out from the fire on to the edge of your fire pit. 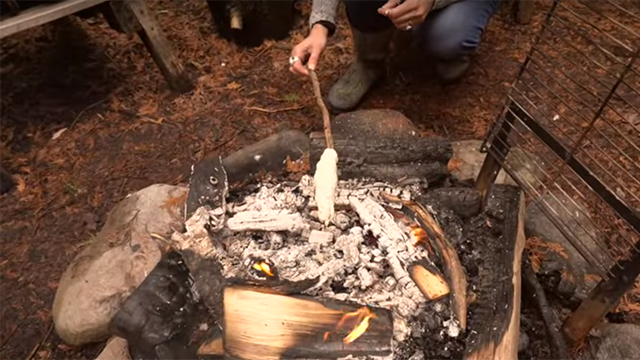 Hold the stick over the coals, turning frequently until your bannock is brown and cooked through. You can also fry in lard, bacon fat or oil in a pan and sprinkle with sugar as a treat.